The timing for this Forum is optimal. After years of recession, Greece is returning to a period of economic growth and aims to position itself as an attractive investment and business destination. The Forum will provide the audience with a unique blend of informational, marketing and networking opportunities. December marks the 20 year milestone of Capital Link’s commitment to raising awareness about Greece as an investment destination, to a wider investor universe. The conference will feature the developments and reforms in the Greek economy and the Greek government programme for the economy and investments. Also, the latest trends in the capital markets and specific sectors with topics such as Government and Corporate Bonds, energy, infrastructure development, real estate, tourism, banking, non-performing loans management, and global shipping. • Mr. Evangelos Mytilineos, Chairman and CEO of Mytilineos S.A. will receive the “2018 Capital Link Hellenic Leadership Award”, at the conclusion of the forum, during an official dinner at The New York Yacht Club, on Monday, December 10th, 2018. M r. C. Dean Metropoulos, Chairman & CEO, Metropoulos & Company will introduce Mr. Evangelos Mytilineos, Chairman & CEO, MYTILINEOS. 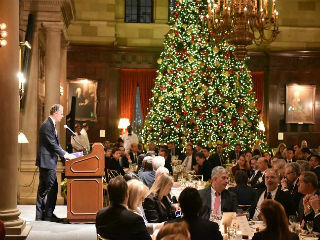 • On Tuesday, December 11th, 2018, we will celebrate “Greek Day at the New York Stock Exchange”where the Greek Delegation, Greek companies listed on the NYSE and companies which participated in the forum will ring the Closing Bell at the New York Stock Exchange, an event of unique visibility throughout the world. The event will be broadcast live on major news stations in the United States and abroad to an audience of millions of viewers worldwide. H.E. Haris Lalacos, Ambassador of Greece to the United States will deliver the Opening Remarks to the Forum. As in previous years, the Forum will provide delegates with unique networking opportunities through one-to-one meetings with listed and unlisted companies, as well as, with members of the Greek government delegation. Citi and Tsakos Energy Navigation are Global Lead Sponsors of the Forum for ten years in a row. Supporting Sponsors: Atlantic Bank • Flott & Co. PC • Rodoula S.A. The "2018 Hellenic Capital Link Leadership Award" will be presented to Mr. Evangelos Mytilineos, Chairman & CEO, MYTILINEOS recognizing his company’s outstanding contribution to Greece, during an official dinner at The New York Yacht Club on Monday, December 10, 2018. Mr. C. Dean Metropoulos, Chairman & CEO, Metropoulos & Company will introduce Mr. Evangelos Mytilineos,Chairman & CEO, MYTILINEOS. The dinner Keynote Speaker will be Mr. Matthew Palmer, Deputy Assistant Secretary European and Eurasian Affairs, U.S. Department of State. The Dinner is sponsored by EY. Within the context of the “20th Annual Capital Link Invest in Greece Forum”, the New York Stock Exchange will organize in cooperation with Capital Link a special celebration of “Greek Day at NYSE”, on Tuesday December 11, 2018. The Greek Delegation, Greek companies listed on the New York Stock Exchange and companies which participated in the Forum, will ring the Closing Bell at the New York Stock Exchange, an event of unique visibility throughout the world. The event will be broadcast live on major news stations in the United States and abroad to an audience of millions of viewers worldwide. Our proactive approach, which integrates Investor Relations, Information Technology and Media, enhances awareness and branding for our clients through tailored outreach programs targeting analysts, institutional and individual investors and the financial media complemented by extensive and uniquely powerful marketing platforms. Capital Link offers a full suite of services including strategic and corporate advisory, investor relations, media relations, public and industry relations and the organization of corporate events. Capital Link is also known for the organization of large scale, high quality Investment Forums focusing on maritime transportation and U.S. investment products in key industry centers, such as New York, London, Athens, Limassol, Shanghai, Singapore and as of this year in Tokyo. We organize twelve to fourteen conferences annually, of which seven are focused on the maritime sector. The Capital Link Investment Forums feature industry leaders and draw the elite of the global financial and investment communities. The Capital Link brand is widely-recognized and valued worldwide by participants in these communities for combining rich informational and educational content with as well as superior networking opportunities. In addition to conferences, Capital Link organizes Webinars focusing on investment strategies, sectors, critical topics of interest to the investment community and company presentations. Capital Link's global marketing platform enhances the visibility and reach of these events on a global scale that lasts well beyond the date on which each event is held, becoming a continuous reference point for market participants.